In Germany, most people do not eat much directly after they have woken up. Those who wake up early will generally eat a light breakfast, which consists of some bread or rolls. They also drink coffee which is prepared with canned milk and sugar. Children sometimes eat oatmeal or porridge and raisins. Following this initial-semi meal, most people take prepared sandwiches with ham and cheese to school, when their appetite fully sets in. This breakfast snack is usually consumed around 10:00 AM. Those who have less stringent lifestyles will have sausages and beer for this snack. The midday meal or lunch is the main meal of the day. Traditionally, people will eat lunch with their families. However, more and more women are working out of the house, and fewer couples are having kids in Germany. Especially in cities, this designated meal is not always a family daily activity any more. Nevertheless, the German midday meal will typically consist of Eintopf, a German thick stew with meat and vegetables, and a dessert. German desserts consist of cookies, strudels and other buttery baked goods. In the afternoon, Germans usually enjoy a coffee and a pastry to hold them over until supper. It is a stereotype that Germans drink a lot of coffee, but it’s usually true! You’ll find coffee everywhere, like much of Europe. The evening meal in Germany is usually served around 7:30. It is much lighter than midday meal. 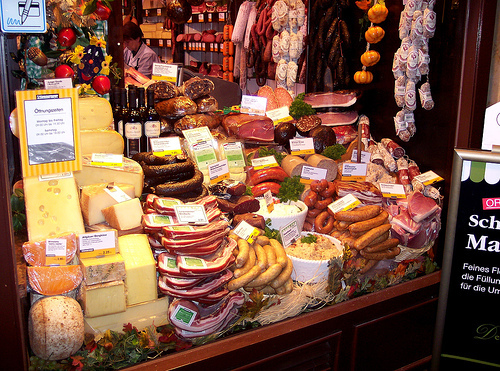 Some examples of German suppers include soups, some cold cut meats, sausages, cheese, bread or rolls. Many Germans eat a side of iceberg lettuce salad along with supper. If you want to eat out, there are many different restaurants in Germany, as well as beer halls (Bierhallen), lunch counters (Schnellimbiss-Stube) and milk bars for milk shakes (Milchbar). Biergartens generally open in the summer with a back patio with picnic peoples and people to enjoy large steins of beer and sing drinking songs. This is more common in Bavaria than elsewhere. There are a lot of immigrants from the Middle East and Turkey present in Germany (especially Berlin), so you’ll also find fast food joints that serve Doner Kepab (gyro) and falafel. German sausages are very famous. There are over 1500 types of sausage! Sausages are made out of pork, chicken and beef. 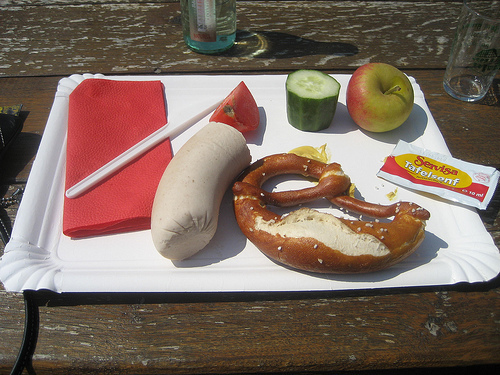 In Bavaria, you’ll find many white sausages, or Weißwurste (veiss-vurste). In Franconia, people eat more Bratwurst, which is made of pork, veal or beef. Germans often eat potatoes and potato dumplings with their sausages. 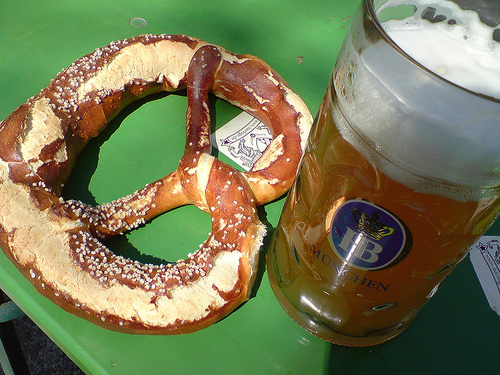 The pretzel is also a traditional German food. They will cut pretzels in half and put a slice of meat and mustard in the middle for a sandwich in Munich. This sounds pretty close to what I experienced. I haven’t heard of the after-breakfast snack. I love the tradition of Kafee und Kuchen (coffee and cake – but I probably spelled all that wrong). We often ate cereal for breakfast in Germany – the adults liked raw oats cold with milk. But bread with butter and jam is always common. Lunch varied, but was the hot meal of the day, and could be quite filling. They skipped lunch on the weekends, got up late and had a big breakfast with salmon and eggs with bread, jam, honey, etc.